Consume 1 to 3 portions per day to supplement glycogen. The final number of portions adapted to the physical activity undertaken. To prepare 1 portion should dissolve 50g powder approx. 400 ml of water. The product prepared especially for athletes, aims to supplement the glycogen stores. It contains ingredients allowing the possibility of consumption for peoplenot practicing sport. It should not be used as a substitute for a varied diet. Necessary to support the body with above-average effort. The best way to replenish glycogen and electrolytes lost. Liquid form does not burden the stomach and is comfortable to use. To prepare 1 portion just mix 50g powder with approximately 400ml of water. You can consume 1 to 3 portions per day, depending on the planned or physical activity undertaken. The product is ideal for the typical "load" of carbohydrates, planned for 3 days prior to the long exercise: marathon or competition. Then I recommend eating 3 portions daily product. Prepared 3 portions of fluid should be drunk during the day, between meals. Cooked drink should also consume during prolonged exercise, for example. Marathon match, strength a workout. The optimum dose is 1 portion every 45-60 minutes of effort. Thanks to this date will fill glycogen and electrolytes lost. The product supports the regeneration, which is why I recommend to eat it also immediately after the workout. To prepare a beverage can be used instead of milk instead of water. A delicious chocolate-nut-flavored cream enriched with whey protein. It does not contain sugar. 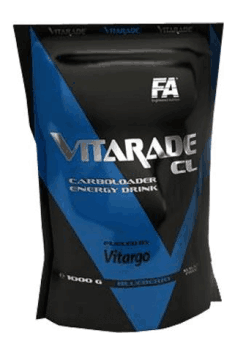 Vitargo is a patented formula of carbohydrates containing a glucose polymer (amylopectin), carbohydrates of high molecular weight derived from barley. Amylopectin has the capability of adaptation, used in influencing on digestive enzymes, allowing the acceleration of the processes of digestion and not retention of undigested food remains in the stomach, and the replenishment of muscle glycogen. Vitargo is used in complementing of carbohydrate diet in endurance sports (pre- and post-workout) and by patients not receiving adequate doses of carbohydrates in natural foods. In the sports supplementation it used as a component of special carbohydrate formula (often used with additional substances, such as amino acids, creatine, electrolytes) or component carbohydrate-protein concentrates.